Explore the lush, natural beauty of the Tegalalang Rice Terraces and visit the sacred Monkey Forest in Ubud! 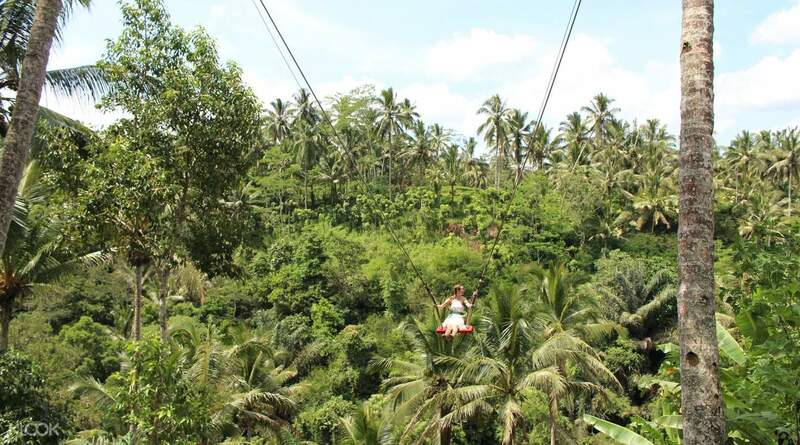 Fly high above the sprawling Ubud forest on the Bali Swing! Visit the famed Gao Gajah sanctuary and neighboring rural villages renowned for exquisite artisan crafts! Wander in paradise as you explore the culturally rich town of Ubud! Conveniently start your tour with a hotel pick up and prepare to be amazed at your first stop: the Art Village that showcases genuine Balinese wares, arts, and crafts. Purchase your souvenirs and bring a piece of Bali with you before heading to Pulina Coffee Plantation for a sip of authentic Balinese coffee. Try out the most expensive coffee in the world—Kopi Luwak—and more exquisite brews locally made from all over Indonesia! If you’re up for the challenge, take the plunge on the popular Bali Swing and soar above the sprawling Ubud forest. The tour continues with a visit to the Tegalalang Rice Terraces. 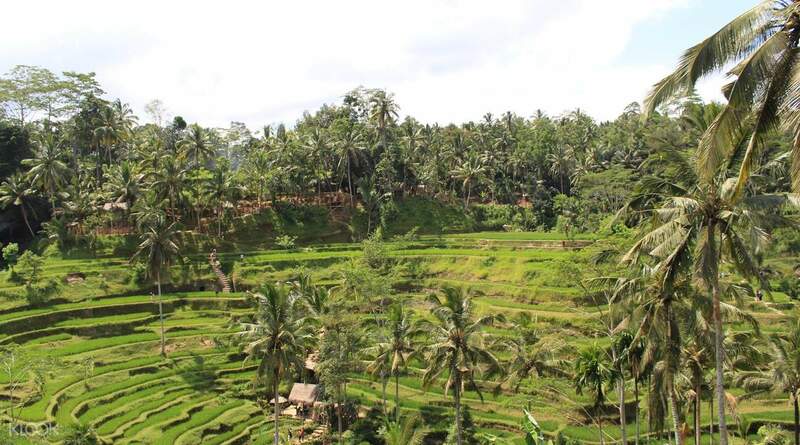 Witness Bali’s famous rice paddies, beautifully terraced landscapes sloping down across valleys. After seeing the spectacular vista, you'll have free time to shop and eat some more. By 3:00pm, arrive at Ubud Monkey Forest, home to over 700 Balinese long-tailed monkeys! Enter a sanctuary of temples, walk around the amazing nature reserve, and even interact with the monkeys by feeding them bananas. Finally, drop by Gao Gajah, also known as the Elephant Cave. Dating back to the 11th century, this mysterious cultural treasure features Hindu and Buddhist imagery and ancient bathing temples! After a day of immersing yourself in the cultural heart of Bali, return safely at your hotel courtesy of round trip transfer services. Who's up for some monkey business? 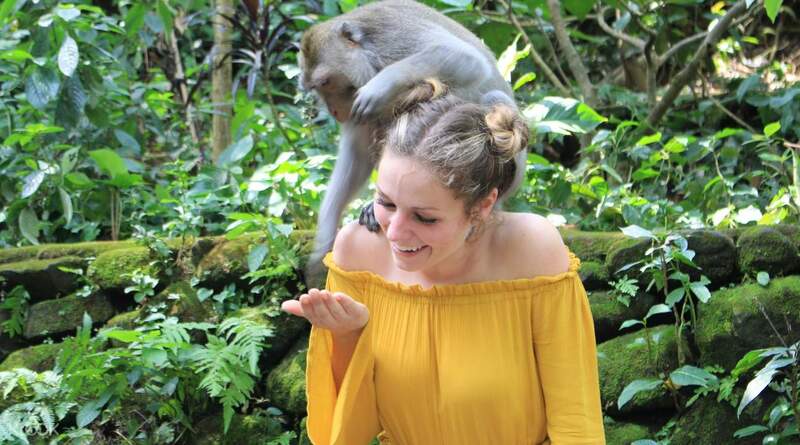 Meet a Balinese long-tailed monkey at the Ubud Monkey Forest! Your Ubud tour in full Bali swing! Thank you to the klook team, specially our tour guide Gantuh for being so helpful and patient with us, as we took our time in Bali swing and Ubud market and still waited patiently. This tour package made our Ubud Tour much more easier and smooth. We also ask Gantuh if we could stop at a cocomart(supermarket) before heading back to the hotel and he kindly helped us with our groceries. Thank you!!! Thank you to the klook team, specially our tour guide Gantuh for being so helpful and patient with us, as we took our time in Bali swing and Ubud market and still waited patiently. 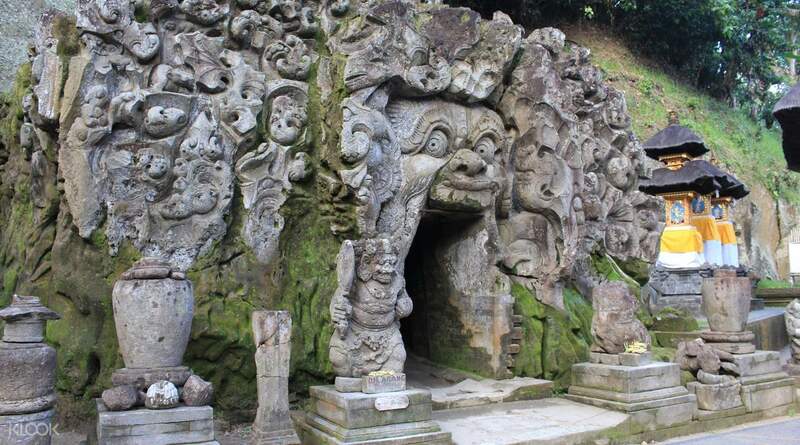 This tour package made our Ubud Tour much more easier and smooth. We also ask Gantuh if we could stop at a cocomart(supermarket) before heading back to the hotel and he kindly helped us with our groceries. Thank you!!! Our drive Ega arrived at the hotel lobby 30min early and that was great for us. Along the way he suggested some places that is not in the itinerary because we had an early start. Lunch was not in the package but he recommend us where to eat. Overall it was worth it. Our drive Ega arrived at the hotel lobby 30min early and that was great for us. Along the way he suggested some places that is not in the itinerary because we had an early start. Lunch was not in the package but he recommend us where to eat. Overall it was worth it. We had a wonderful day very well planned. Our driver Komang Sarka was very polite and helpful. We had the freedom to opt out for some activities we weren't interested in so much and spend more time at the places we liked most. We enjoyed our trip. We had a wonderful day very well planned. Our driver Komang Sarka was very polite and helpful. We had the freedom to opt out for some activities we weren't interested in so much and spend more time at the places we liked most. We enjoyed our trip. Our driver was very accomodating. Though we haven't explored Ubud Market because we thought it's some other place far from Ubud Palace, he brought to some other market with cheaper price. But I want to explore Ubud Market though, might book some other tour for that. But overall the tour is great, lots to see and I so love the Bali swing of course. Our driver was very accomodating. Though we haven't explored Ubud Market because we thought it's some other place far from Ubud Palace, he brought to some other market with cheaper price. But I want to explore Ubud Market though, might book some other tour for that. But overall the tour is great, lots to see and I so love the Bali swing of course. Very nice tour. The driver was very accommodating and very friendly. The art village we’ve went to was not that nice since the driver was confused of which place is the best to go to. The best part is the swing and the monkey forest where we spent most of our time. Very nice tour. The driver was very accommodating and very friendly. The art village we’ve went to was not that nice since the driver was confused of which place is the best to go to. The best part is the swing and the monkey forest where we spent most of our time. It is a very fulfilling trip, we have so many good places to visit we felt we understand more about Bali and it's culture. The driver is very kind and we can stop as long as we wish. We visited : Art Village, Kopi Luwak, Bali Swing, Tegalalang Rice Terraces, Monkey Forest, Goa Gajah and some extra stop when we passed by temples. This is a highly recommended package for anyone who wishes to know more about Bali. I give five stars for this event! Enjoy! It is a very fulfilling trip, we have so many good places to visit we felt we understand more about Bali and it's culture. The driver is very kind and we can stop as long as we wish. We visited : Art Village, Kopi Luwak, Bali Swing, Tegalalang Rice Terraces, Monkey Forest, Goa Gajah and some extra stop when we passed by temples. This is a highly recommended package for anyone who wishes to know more about Bali. I give five stars for this event! Enjoy! Our driver Jody was on time and waited for us at our hotel lobby! All the places we went were amazing. We didn’t add the Bali swing in this itinerary but our driver asked us if we still wanted to go. In the end we went and spend about SGD$50 on the Bali swing with unlimited swings and free food. The Paulina coffee plantation was great as we get to try different types of coffees and teas! The staffs there were very friendly. We also head to the rice terraces, monkey forest and elephant cave! It was a day packed with activities and I highly recommend to visit each and every one of them! Our driver didn’t really follow the time and allow us to be free and easy and didn’t rush us at all. We were kind of behind time as we reached our hotel at about 9pm! Take note, Bali’s traffic is really bad especially at night! Really thanks to our driver Jody for being so patient with us throughout this journey as we had lots of fun! Our driver Jody was on time and waited for us at our hotel lobby! All the places we went were amazing. We didn’t add the Bali swing in this itinerary but our driver asked us if we still wanted to go. In the end we went and spend about SGD$50 on the Bali swing with unlimited swings and free food. The Paulina coffee plantation was great as we get to try different types of coffees and teas! The staffs there were very friendly. We also head to the rice terraces, monkey forest and elephant cave! It was a day packed with activities and I highly recommend to visit each and every one of them! Our driver didn’t really follow the time and allow us to be free and easy and didn’t rush us at all. We were kind of behind time as we reached our hotel at about 9pm! Take note, Bali’s traffic is really bad especially at night! Really thanks to our driver Jody for being so patient with us throughout this journey as we had lots of fun! Very reasonable price. Driver was very friendly and can speak English. Bali swing is a must go. But try to go earlier. The crows usually come in around 11am. Very reasonable price. Driver was very friendly and can speak English. Bali swing is a must go. But try to go earlier. The crows usually come in around 11am.